Update (Oct 13th): I just learned that there is also a biostatistics search going on the in the Math department! The Biology Department at SF State is hiring in three areas this year: Physiology, Human Genetics/Genomics and Plant Evolutionary Biology! I am very excited about this, so I thought I share the info on my blog. Please forward the information to people who may qualify for one of the jobs. As you may know, I joined this department just a few weeks ago, but until now (during the interview process, the negotiations and when starting the job) my experiences have been extremely positive (I wrote about my job earlier here). I strongly encourage you to apply for one of these jobs! Feel free to shoot me an email if you have any questions! The Biology Department at SF State is by far the most diverse department I have ever seen, and there is motivation to keep increasing the diversity of the faculty. According to our website, we have almost 50 tenured or tenure-track professors in the department and 40% of them are women. You should know that the Department doesn’t have a PhD program, but it has several Master’s programs. The Master’s students I have in my class this semester are smart and motivated. Most faculty in the department run active research labs with undergraduate and graduate students and sometimes postdocs. Many have active collaborations with nearby institutions such as Stanford and UCSF. Both research and teaching are highly valued in the department. People are hired with the expectation that they get tenure, and even though I haven’t seen the data, I guess that the rate of getting tenure is around 90%. Applications are taken through the Academics Online websites following these links for Physiology, Plant Evolutionary Biology and Human Genetics/Genomics. The committees will start reading applications from October 15th. Three Reference Letters (you’ll provide names and email addresses and the Academics Online will ask your letter writers for a letter). We seek outstanding candidates whose research addresses fundamental areas of physiological research, including, but not limited to, vertebrate or invertebrate comparative physiology, integrative physiology, and environmental or ecological physiology. Responsibilities include teaching an upper-division physiology course with laboratory each year, and other courses in the undergraduate and graduate programs. We seek candidates from all areas of human genetics and genomics, especially individuals whose interests complement existing departmental strengths in cellular and molecular biology, human health, population genetics and bioinformatics. We are searching for individuals who focus on human epigenetics, reconstructing human history, personalized medicine, health disparities, human genetic diversity, human population genomics, disease mapping, human physiology, or human genome evolution. Responsibilities include teaching an upper-division genetics or human genetics course, and other courses in the undergraduate and graduate programs. This position is part of a cluster hire in the University focused on Big Data & Health. Other positions within the cluster include scholars in the Department of Economics (Health Economics) and in SF State’s Health Equity Institute (Health Informatics). As part of this cluster, the three hires will be expected to work together on areas of shared interest in order to facilitate interdisciplinary research and curricular collaborations across Departments and Colleges. The new hire may be affiliated with the Health Equity Institute. Chair of the search committee: Scott Roy , other members: Laetitia Marquez-Magana and Pleuni Pennings. We seek outstanding candidates who are addressing fundamental problems in plant evolution, especially individuals whose interests complement existing departmental strengths in plant molecular genetics, ecology, and bioinformatics. We are searching for individuals who focus on phylogeny or speciation, aspects of ecological adaptation, population genetics, genomics or phylogeography in an evolutionary context. Responsibilities include teaching an upper-division plant taxonomy course with laboratory each year, and other courses in the undergraduate and graduate programs. Chair of the search committee: Dennis Desjardin, other members: Kevin Simonin and Gretchen LeBuhn. SF State is also searching for a new dean of the College of Science and Engineering! This week I decided to do some of my own homework. Just for fun. 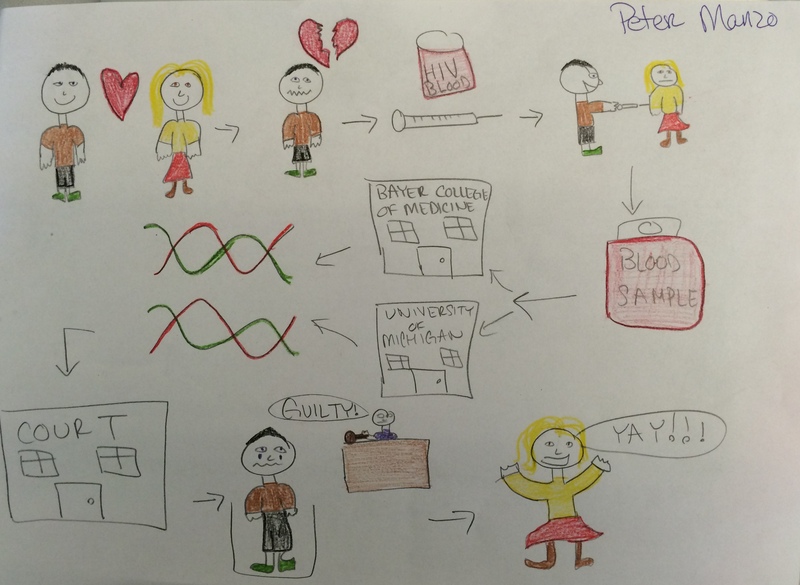 It’s a graphical abstract of a classic paper we read in class. Turns out, making a graphical abstract is no easy task! Next week, there’ll be students’ work here again. 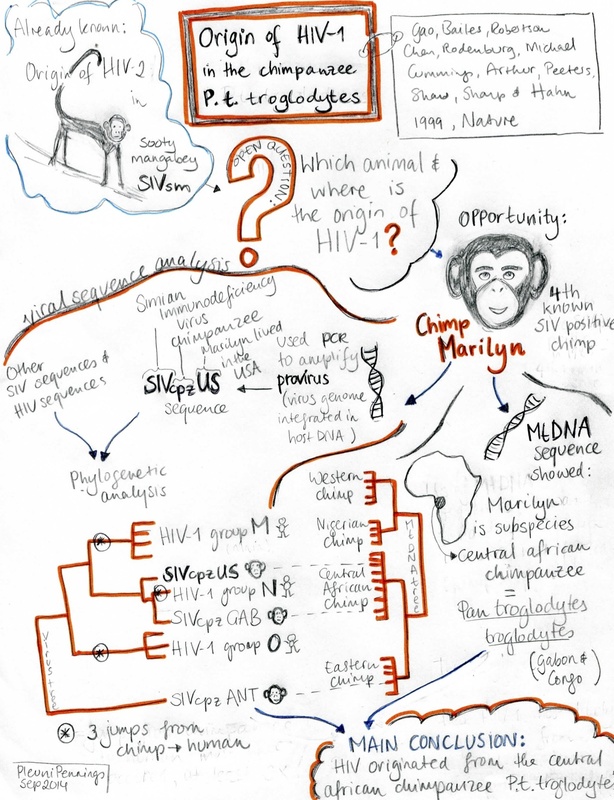 What I found most surprising about this paper is that they had to sequence the chimps’ MtDNA to find out what subspecies they were. I would have expected that experts could simply look at a chimp and know what subspecies it is. Gao F, Bailes E, Robertson DL, Chen Y, Rodenburg CM, Michael SF, Cummins LB, Arthur LO, Peeters M, Shaw GM, Sharp PM, Hahn BH. Nature. 1999 Feb 4;397(6718):436-41. It is the fourth week of the semester in San Francisco and the students in my class keep producing interesting content! 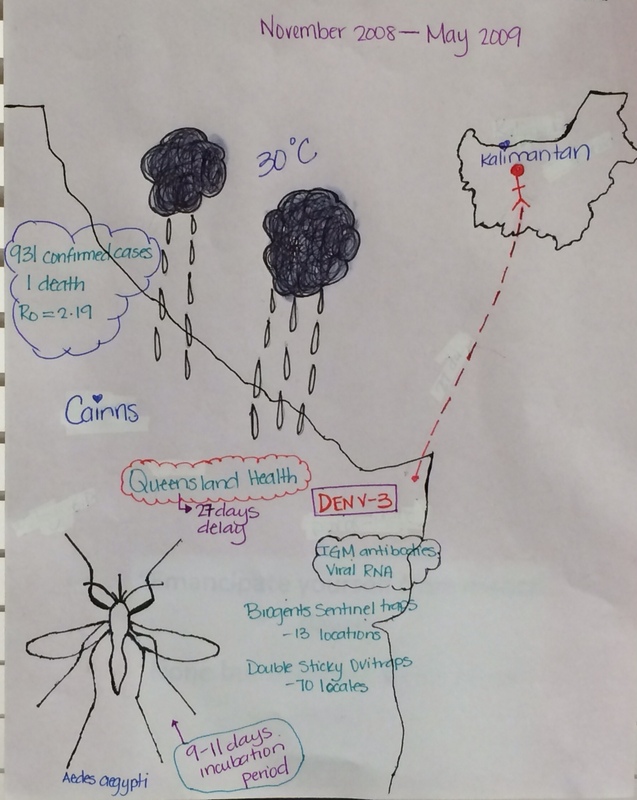 This week we read a paper on a Dengue outbreak in Australia. One of the conclusions of the paper was that the outbreak was started by a person who traveled to Indonesia and brought back the virus to Australia. The students were a little surprised when they realized all the seemingly unlikely things that must have taken place for the epidemic to get started: the traveler must have been bitten by a dengue-infected mosquito in Indonesia, then they* traveled back to Australia, where they must have been bitten by a mosquito again, and this mosquito must then have survived long enough (the extrinsic incubation period of the virus) so that it could transmit the virus to other humans, and finally this mosquito must have actually bitten one or more other humans to transmit the virus to them. *Edited on Sep 26 to use the gender neutral singular “they” in stead of s/he. The students in my class are all master’s students in the Biology Department of SF State. Who are the authors of the paper? This article focuses on the epidemic of DENV-3 in Cairns Australia. Dr. Scott A. Ritchie works in the school of public health; tropical medicine and rehabilitative science at James Cook University, Cairns Queensland Australia. He leads a group dedicated to the study of vector-borne diseases. He is the principal investigator in the Eliminate Dengue Program funded by the Bill and Melinda Gates Foundation. He is involved with research projects ranging from global warming to monitoring the course of Dengue and other viral diseases. He has received numerous grants from different institutions to aid the control of mosquito related infections. Dr. Andrew F. Van Hurk also focuses on Dengue virus. His research is related to molecular studies and phylogenetic studies of virus and has 83 publications. Dr. Hurk is a supervising scientist-entomology at the Queensland Health Forensic and Scientific Services in Australia. When it is raining and warm outside, there are more small flying things with six legs that bite. They drink people’s blood for food. Sometimes, they have even tinier bad things living inside them. These tiny things can get into the blood if a person is bitten, make them sick, and even kill them. This happened in the land down under two times during 1998 and 2008. People studying this found out that the really tiny bad things needed to live in the flying things for a shorter time in 2008 than 1998 before they can move into people. It is very interesting to know that the time spent in the flying six legged thing can change how quickly and how many people can get sick. Even though the 1998 kind can get into people more often, the 2008 sort doesn’t have to wait as long in the flying thing in order to get into the blood so they end up having about the same chances of getting into people and making them sick. The people studying this also found out that the 2008 tiny bad thing probably came from a person who went to another land then came back with the tiny thing in their blood. They know this because they found that the 2008 tiny thing was more like other tiny things from the other lands than tiny things from the land down under from the past. I felt that the introduction was lacking in background. It moves from broad to narrow too quickly, and left me with questions about Dengue and DALYs values. When discussing environmental conditions, the authors do not extrapolate on how certain conditions enhance Dengue outbreak. They also state that Figure 3 has 100% bootstrap support. From my limited knowledge of bootstrapping, this seems a little too good to be true. So every time they bootstrapped their data, it came out with the same tree every time? And some of the results sections like “Vector Competence Experiments” actually read more like methods than results. Overall I thought the paper didn’t have many ethical issues, and they made a good case for why their work was important, but the actual experiments, data, and relevant background were lacking in detail and made the paper boring. I am teaching a graduate seminar at SF State on contemporary evolution of human viruses. Colleagues advised me to pick the papers for the entire semester beforehand, to reduce work during the semester. I didn’t do that, however, because I wanted to be flexible and choose (partly) based on what the students liked or what the students had trouble with. 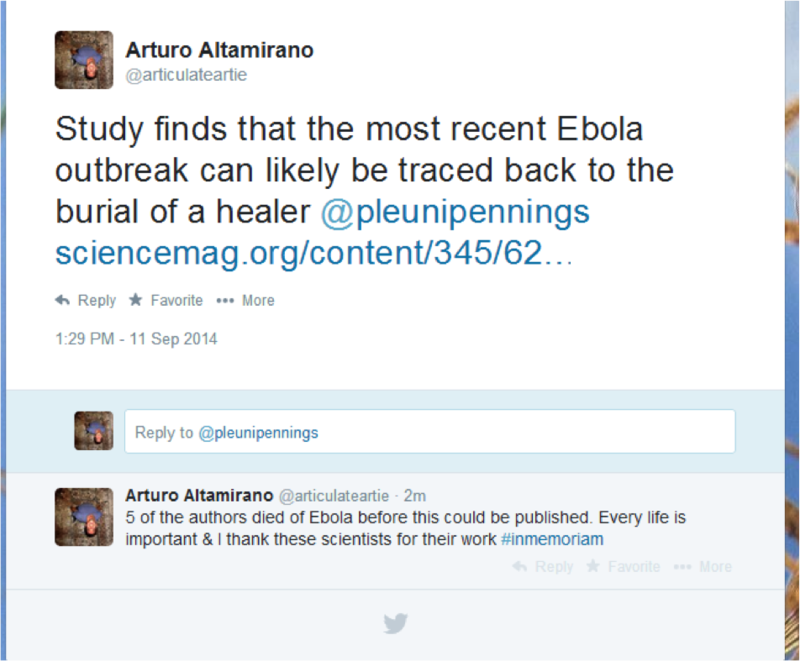 The result was that in the second week of class, I could hand out a brand new paper on the 2014 Ebola outbreak. Now that is contemporary! The only trouble is that from now on, every other paper I choose will seem old; a Dengue outbreak in 2008? How ancient! Here is some of the homework by the students in my class. I hope you enjoy reading it. 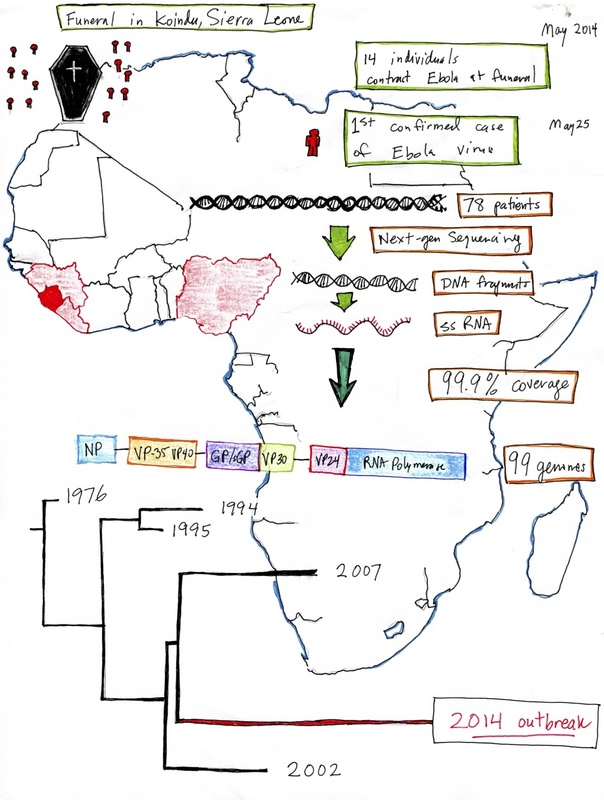 This paper focused on identifying the transmission route of the Ebola virus disease (EVD) outbreak throughout West Africa, whether the outbreak continues to be supplied by new vectors, and how the virus has changed to infect humans. The scientists used parallel viral sequencing and they ended up generating 99 EBOV genome sequences from 78 confirmed EVD patients. Phylogenetic comparison of all genomes from earlier outbreaks, suggests that the 2014 EBOV likely spread from Middle Africa within 10 years. Patients sharing intrahost variation showed specific transmission patterns in West Africa, and this suggests that transmission of viral genetics may be common. Something new found in this study was that in contrast to previous EVD outbreaks, human-reservoir exposure is unlikely to have contributed to the growth of this epidemic. In addition, the EBOV catalog of mutations will aid in future studies. One main question that this paper addresses is whether or not future studies can monitor viral changes and adaptation, and understand how to contain this expanding epidemic. As this paper was largely descriptive in nature, I am wary to try to define the main scientific conclusion. With regard to concrete discoveries, however, their data suggests quite strongly a single point of origin for the outbreak of Ebola virus disease (EVD) in Sierra Leone, involving two different strains of the virus introduced simultaneously. Additionally, they document with high fidelity possible transmission links between groups of patients. More important is the demonstration of the utility and information density available through the types of rapid sequencing and analysis employed in this work. Although not a protocol paper, the authors have produced a technical tour de force with a great deal of insight into the disease dynamics involved in the recent Ebola outbreak. I am sure that, as sequencing costs continue their steep decline techniques of this sort will only become more common, and the community will begin to adopt standard practices for these types of studies. This sort of adoption and standardization will have broad implications for the future of disease mitigation. Tempered by the human genome project’s underwhelming applicability to medical breakthroughs, I remain optimistic that as genetic data is more readily applied to patient treatment, it is likely that information of this kind will contribute to tangible medical interventions which will directly benefit patients around the world. The paper mentioned that when the first Sierra Leone case of Ebola virus disease (EVD) was confirmed, the tracing led to 13 more sick females who attended the burial of a traditional healer. It was misleading to seem the females are more prone to contract the disease than the males because the gender ratio of the funeral attendees wasn’t provided. It was informative but boring to read when a bunch of numbers were given like single nucleotide polymorphisms (SNPs) between the 2014 EBOV genome sequences and the previous EBOV outbreak, and the numbers of intrahost single nucleotide variant (iSNV) in Sierra Leone patients. The wording was a bit confusing sometimes. One ethical issue could be sequencing for other pathogens when the 35 EDV suspected cases turned out negative for EBOV. In my new job at SFSU, I am teaching a seminar on the evolution of human viruses. We are reading one paper every week and every student gets a different assignment for each paper. We’ve done one week now and I am very happy with the results. The paper we read was Metzker et al (PNAS, 2002), it is about using phylogenetic methods in an HIV infection case that went to court (thanks to Graham Coop for suggesting the paper). The Metzker et al. study details the first instance of the admission of phylogenetic analysis as forensic evidence in a criminal case. It sought to determine whether scientific support existed for the proposed viral transmission event between the suspect (via injection of blood from an HIV-positive patient) and the victim by inferring phylogenies of the patient, victim, and HIV-infected control strains from the same geographic region using two loci under different selective pressures. In trees generated from both loci, the isolates from the victim clustered with the patient’s, supporting a close relationship between victim and patient HIV strains. Phylogenetic analysis has previously been used in inferring HIV transmission events, notably in the “Florida dentist case”. Five individuals were inferred to have contracted HIV-1 from their dentist based on the distinct clustering of their strains with the dentist’s relative to geographically similar HIV-positive controls. Who are the (main) authors of the paper? Dr. Michael Metzker, the primary author of Molecular evidence of HIV-1 transmission in a criminal case (2012), is an associate professor at Baylor college of Medicine and Rice University where he teaches human genetics. Additionally, he is president & CEO at RedVault Biosciences, a technology company that aims to advance personalized genomic medicine. Metzker is also an active researcher in the field of bioinformatics and next-generation sequencing. The last author of the preceding publication is Dr. David Hillis, who is a current evolutionary biology professor and former director of the biology and bioinformatics department at the University of Texas (Austin). Hillis’ research focuses on experimental laboratory evolution; he believes that by studying this process we can ultimately gain insight into the underlying mechanisms that drive evolution. This paper is about a doctor who tried to kill his girlfriend by using blood from a sick person. The doctor got the blood from their work and stuck their girlfriend during a fight. The important part of this case is the way that they showed that it really was the doctor who made the woman sick. For this case, tiny changes that happened in the thing that made the woman sick were found. These changes can show which person made the other people sick and show the relationships between all of the sick people. By looking at these changes and the relationships, they showed that the doctor was the one who was at fault for making the woman sick.